Omg, QUICHE. I love it so much. And because I have been vegan for over a decade, I haven’t really had an authentic quiche in a minute. The reason for this is because most vegan quiche is made from tofu. WHiCh iS FiNe! But it’s not quiche. It’s a tofu pie. Feel me? Not anymore y’all! The time has come for my quiche recipe to enter the world. One that is vegan and without tofu. A triumph! The answer? JUST Egg. It’s an incredible product made from mung beans. It scrambles just like eggs and it also makes an excellent quiche filling. Fluffy, yet firm, rich and satisfying- this plant-based egg works beautifully. To find it, check the section of your grocery store that sells refrigerated plant based options. As for the crust, I used store bought and I am NOT ashamed to admit it. Most brands are actually vegan, just check for lard or milk. TBH, I wasn’t in the mood to make crust and I’m sure you won’t be either. Of course, feel free to use you own homemade crust. Either way, you’re going to have to par-bake. And even thought it’s an extra few steps- it’s definitely the way to go. This creates a flaky bottom which makes the overall experience optimal while consuming quiche. Now, full disclosure, I’ve made this recipe without par-baking the crust and it came out just fine. The soft, squooshy bottom crust was still delicious and the overall effect of quiche was met. However, I did offer a sample to my family, explaining to them that I was perfecting the recipe for my blog. My aunt delicately, yet assertively, pointed out that the crust on the bottom was in fact raw and if the recipe were to be perfected it should be par-baked. I knew she was right and that I was just being lazy. So there. Do what you will! Oh yeah, did I mention there are TWO recipes? That’s right! I’m such a sweetheart. First up, I have a springy and bright quiche with fresh dill, baby greens, and cherry tomatoes. I’ve always loved dill in quiche. The fluffy egg mixture and buttery crust are the perfect blank canvas for such a pungent herb. A touch of nutmeg makes this one super special. Next up, I have a combination that is inspired by ‘Quiche Lorraine’ with smokey tempeh bacon, caramelized shallots, and a good amount of cheese. All the flavors in this version really hit the mark for me. Quiche realness if you will. I like to add crushed red pepper flakes for a little kick. Give that a go for sure. Ok, let’s get to cookin’! Par-bake the crust: preheat oven to 400 degrees F. Cover pie crust with parchment paper (or foil) and fill with baking beans (to keep bottom of crust from rising). Gently press down on the beans and wrap the parchment/foil around and under the crust. This will prevent the crust from burning. Bake 400 degrees for 12 minutes. Reduce temperature to 325 degrees. Remove baking beans and parchment paper/foil, prick holes in bottom of pie crust with a fork and bake for an additional 8 minutes. Add chopped onion, greens, and nutmeg to the pan on medium heat with 2 tablespoons of olive oil. Sprinkle with salt and pepper to taste. Cook for about 6-7 minutes, stirring every so often, until the mixture has cooked down and most of the water has evaporated. Sprinkle ¼ cup shredded cheddar cheese on the bottom of the pie crust. Add cooked onion and greens mixture. Top with chopped fresh dill, nutritional yeast, and crack of fresh black pepper. Shake Just Egg vigorously and evenly pour over quiche filling. Garnish with halved tomatoes and parmesan. Bake in 325 degree oven for 60 minutes, or until the center is set. Let cool 15-20 minutes and sprinkle with kala namak and fresh dill. Serve warm (or cold if you’d like!). Add ⅓ cup chopped shallot and 3 ounces of chopped tempeh bacon to a pan on medium heat with 2 tablespoons of olive oil. Stirring every so often. Cook for about 10 minutes until the tempeh has browned and the shallots are soft. Sprinkle ¼ cup shredded cheddar cheese on the bottom of the pie crust. Add cooked shallot and tempeh bacon filling on top of cheese into pie crust.Top with fresh or dried thyme, nutritional yeast, and crack of fresh black pepper. Shake JUST Egg vigorously and evenly pour over quiche filling. Garnish with sliced shallots, parmesan and crushed red pepper flakes. Bake in 325 degree oven for 60 minutes, or until the center is set. Let cool 15-20 minutes and sprinkle with kala namak, fresh thyme leaves, and crushed red pepper flakes. Serve warm (or cold if you’d like!). For the spinach quiche, you can actually use whatever mix of baby greens you like. For example, baby kale and baby bok choy. Or arugula. You get the idea booger. I like to sprinkle on kala namak at the end because it has sulfur which tastes very eggy. This is not required but I think it’s a nice touch. Of course, warm quiche is ideal but you can certainly serve it cold from the fridge. I must admit, I don’t mind it this way. I’ve been snacking on it for days, grabbing a piece when I am running out the door and spilling crumbs everywhere as I go. Lastly, about the crust. Obviously you can make your own homemade crust. Like, totally. I am just trying to make this recipe as easy as possible for everyone. If you’re a badass in the kitchen and know how to make the most amazing vegan crust ever- you go girl! Have you ever had a muffaletta sandwich? It’s kind of ridiculous. Loaded with multiple layers of deli meats and cheeses, Sicilian olive salad, and a round loaf of sesame seed bread. This sandwich is totally decadent and over the top. It’s no wonder it originated in New Orleans! It was first created and sold at Central Grocery in the historic French Quarter and is still popular to this day. Now, in my humble opinion, the best part about this sandwich is the briny and delightfully tangy olive salad which has carrots, peppers, and cauliflower in combination to the olives. That’s what really seals the deal for me. I also love the bread (which is vegan BTW) because it has sesame seeds on top. Who doesn’t love sesame seeds? When I was walking around a local grocery store here in NOLA, right down the street from my house, I saw some pre-packaged pasta salad. Upon closer inspection, I noticed it was labeled ‘Muffaletta Pasta Salad.’ I gasped, as I frequently do throughout the day, and immediately called my mother asking her if she had ever heard of this. She said yes and I gasped again. From that moment on, I knew that I wanted to make a veganized version for all of you. So here you are! Now, I know what you might be thinking- there’s no meat? Yes. You are correct. There is no meat and it simply doesn’t matter. Mainly because I have upped all of the herbs and spices to the max so the overall flavor is still there. Instead of using a pre-made jar of olive salad (which is not accessible to all) I’ve used the whole variety from an olive bar and cut them into slices, along with some pickled cauliflower and carrots. Capers and peperoncinis elevate the whole blend to excellency. For sweetness and color, I’ve also added some roasted red pepper. For a nice crunch, chopped celery and carrots. And for flavor, fresh dill, oregano, parsley, and red onion. I wanted the dressing to be bright and flavorful, so red wine vinegar it is, along with some tamari, garlic and nutritional yeast. Instead of using bread, like in the traditional recipe, we’re going to use pasta noodles for a fun variation. For the cheese, we’re using vegan parmesan shreds and a smoked provolone. You could use whatever kind of vegan cheese you like, but a smoked variety works particularly nice with this salad. Of course, to finish this dish perfectly- a hefty sprinkling of toasted sesame seeds. Fill a large pot with water and a healthy sprinkling of sea salt. Bring to a boil, add pasta noodles, and boil until al dente. Once done, drain and cool down with cold water. Return back to the pot and drizzle with a good amount of olive oil. Toss and set aside. Chop and prepare all of the olive salad ingredients and add them to the pot of cooked pasta as you go. Toast the sesame seeds in a dry pan/skillet over medium heat, moving them around so they don’t burn, until they smell fragrant and are just toasted. Add them to the pot of pasta and olive salad. 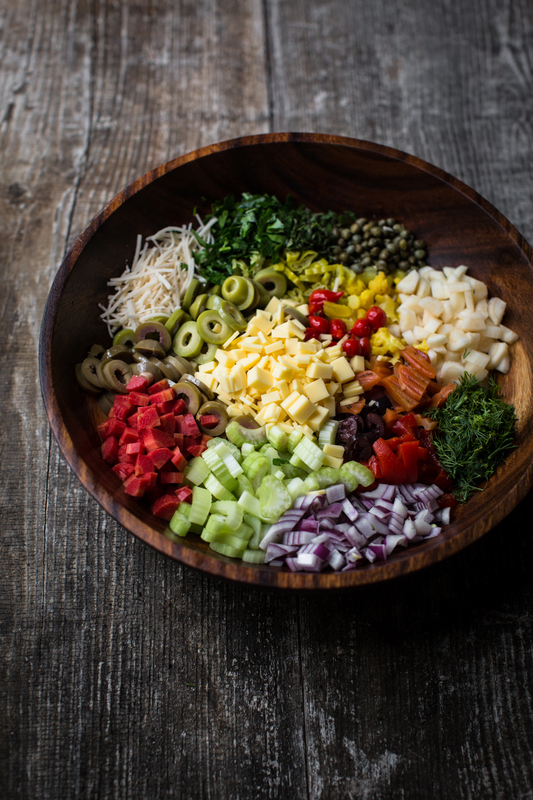 Combine all of the dressing ingredients together into a small bowl. Whisk until smooth and pour over the pasta mixture. Stir everything until ingredients are well incorporated. 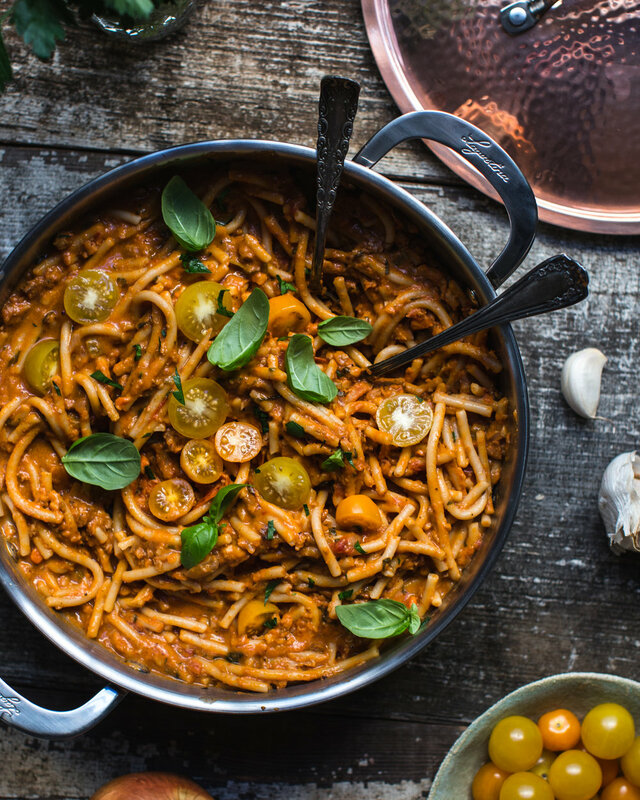 To serve, divide pasta into bowls and garnish with reserved fresh herbs. For the olives and pickled vegetables you have two options: 1. Olive bar! 2. Pickled section of the grocery store. If you haven’t noticed olive bars have a large assortment of ingredients other than just olives, so check them out. If you can find some Peruvian peppers, that makes for a great garnish. For the cheese I recommend using smoked gouda or provolone variety. If you can’t find those, go with a regular provolone or sliced mozzarella, as long as they are vegan. If they aren’t vegan the recipe won’t work. To make this salad extra pretty when serving, make sure to grab any tidbits from the bottom of the bowl and sprinkle them on top. Or set some of the chopped ingredients aside until ready to serve. Basically, you want to see all of the ingredients on top of the salad so each person knows exactly what they are eating and it also looks super appetizing. Also notice how I sprinkled on fresh herbs as well to make the dish pop. It’s called food styling people, get into it. The time has come my lovelies! My ‘White Truffle Macaroni & Cheese’ is finally here. Now, if you’ve been paying close attention, you will notice that I made this variation over Thanksgiving and I had quite a few of you ask me to share the recipe. Fast forward four months later, you can imagine how good it feels to finally share it with you. I took my time fine tuning it and now I can honestly say it’s perfect and ready to go. This recipe is very similar to my traditional mac and cheese (which is actually the most popular recipe on my blog). The main difference is I cut back on the water and removed the cornstarch. The results are still thick and creamy. Although I love what the cornstarch adds to the original texture, I also wanted to try a version without it and I think it is just as delicious. I also added a carefully selected group of powerhouse ingredients to elevate the flavor of the dish to be over the top and decadent. The two most important ingredients to this newly revised recipe are: white truffle oil and roasted garlic. What I am about to say is very important so listen up! You MUST invest in some REALLY good white truffle oil. This specialty oil is expensive and it should be. It is infused with an incredibly expensive, fragrant, and highly desirable mushroom that grows wild and underground. It is one of the most exquisite ingredients humans have to consume. I do not want any eye rolls when you see the prices for different bottles on the market. My favorite white truffle oil is from the Filling Station in NYC. I have also used this one from Amazon and would recommend it as well. A good trick to finding the best white truffle oil is to smell it. When you open a bottle of good oil, it should hit your nose intensely and make your eyes roll into the back of your head. Smelling and consuming fragrant white truffle oil is a sensual experience. Do note that this oil is not intense like say a spoonful of soy sauce or hot sauce. It doesn’t explode on your tongue like that. It is more of a deeply aromatic experience than anything. Take your time while eating and savor it. If you think you can get away with using black truffle oil- think again! White truffles are more flavorful and aromatic. This makes them more expensive and thusly, the oil is more expensive. Don’t worry tough, this recipe only calls for 1 to 2 tablespoons, so even if the bottle is really nice, it should only be around five dollars worth. As for roasting the garlic it is so easy! Please trust me on this, no melt downs if you’ve never done it before. There are literally a dozen ways to do it. The basic idea is to slice the tip of the garlic head off to reveal all of the cloves, drizzle with olive oil, wrap or cover with foil or baking vessel, and roast until the cloves are golden and caramelized. You can check out the many ways to do that here. Now let’s get to the recipe. 1. Preheat the oven to 375 degrees F and begin roasting head of garlic. 2. Fill a large pot with water and a healthy sprinkling of sea salt. Bring to a boil and add the noodles. Boil for about 5 minutes, until they are al dente (remembering it’s ok if they are slightly firm because they will cook more in the oven, so no need to worry). Drain with a colander and transfer to a 9” x 13” baking dish (this recipe will just fit in that!) or desired baking vessel. Set aside. 3. In a high-speed blender, add the cashews and water and blend until smooth and creamy. This should take a minute or two. Add the chopped cheeses, butter, dry mustard, nutmeg, miso, peeled roasted garlic head, and cayenne pepper. Start by blending on low and gradually turn up the speed, until you are left with a smooth and creamy sauce, scraping down the sides and moving everything around as needed (please work with your blender, help it out and don’t give it a brain aneurysm). If using a smaller blender, divide the cashew milk in half and try making the sauce in two separate batches. 4. Pour the cheese sauce over the noodles in the baking dish. Mix well. 5. Bake in the oven, uncovered, for about 30 minutes, until the edges are slightly golden and the cheese is thoroughly melted. Remove from the oven, pour on truffle oil, and stir with a large spoon. Let stand for 10 minutes. Serve immediately. Hot Tip! At the very end, turn the oven broiler on and place the baking dish on the top shelf. Watch it closely and it will begin to brown and look gorgeous (only a few minutes). Once desired color is achieved, remove and enjoy. PLEASE STIR AND KEEP CALM. I know someone who made a recipe video of this mac and cheese (who I love) and she ate it right out of the skillet without mixing or letting it sit. She then mentioned it tasted better after it sat out for a while. HeLLo! That’s what the recipes says to do booger! By mixing and letting the dish sit, it becomes thicker and creamier. And believe me you will be rewarded for your patience! For the cheeses, I recommend using a mixture of Field Roast’s Creamy Original Chao Cheese, Follow Your Heart’s Mozzarella or Provolone, and Violife’s Mature Cheddar. The most important thing to remember is only choose pale yellow or white cheese to keep that beautiful color. If you can’t find all 3 varieties of cheese, simply double or triple up on what you can find. It will still be delicious and work beautifully. I recommend avoiding the smoked flavor ones as this will compete with the truffle oil’s delicate flavor. For this recipe, I chose to go with small shells with ridges. I feel as though this recipe is for a special occasion and because it uses such an expensive ingredient (i.e. truffle oil), the shape and feel should be fancy, too. You can use whatever noodles you like, but if you want to be cool like me- stick with the small shells. When making the cheese sauce, please remember to blend the cashews and water FIRST. If you add everything at the same time, your blender will have a very hard time making everything velvety smooth. In fact, it might not even be able to blend up those cashews to the desired consistency. Follow the recipe as written and make the cream first. You will thank me later. If you are allergic to nuts you can use any desired plant based milk (as long as it’s vegan or it won’t work). This may change the texture of this (making it not as thick) and I have not tested it but my gut tells me it should be just fine. I’ve used shelled hemp hearts before (instead of cashews) and it was okay. The flavor was sort of grassy from the hearts, which isn’t ideal, but for all you nut allergy people-you understand. Sorry folks. I hope you all enjoy this recipe. If you make it, please let me know in the comments and/or tag me on Instagram. I love seeing your creations. And most importantly, have fun and order white truffle oil today! Happy cooking! This pink potato soup is the perfect Valentine’s Day recipe. And although the idea is a bit cheesy and I’m single as hell, I still thought it’d be cute to share. The secret weapon to that gorgeous color is raw beet. Just a few small chunks are all you need to create that pop of pink. As for the base, it’s creamy, luxurious, and delightfully savory. A few other simple ingredients come together to make this soup rich, velvety and melt in your mouth delicious. 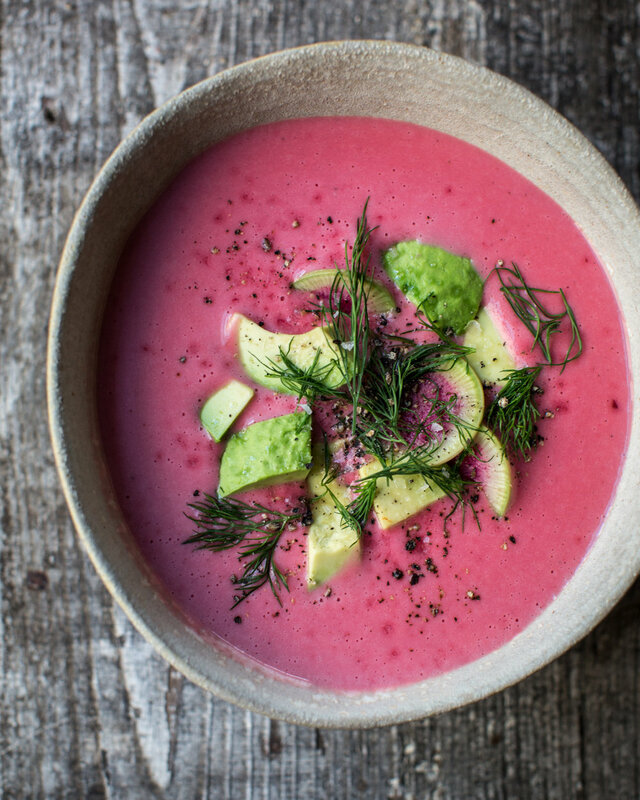 Finish this bowl of pretty in pink with large chunks of buttery avocado, fresh dill and watermelon radishes. Not only do they add fun variations of color, the radish adds a peppery note. However, if you can’t find them-totally skip. Not a big deal. 1. For the soup base combine the water, vinegar, potatoes, cashews, garlic, sea salt, nutritional yeast, onion powder, garlic powder, and bay leaves into a large pot and bring to a boil. Once this has come to a boil and the potatoes are tender, remove from heat. Let cool for about 20 minutes. 2. Once cooled, remove the bay leaves and add the mixture to a high-speed blender. Then add in one piece of raw beet. Blend until smooth. Continue this step, adding more beet, until desired color is reached. 3. At this point, you are ready to serve. Or return it to the stovetop until needed. Making this the perfect make ahead of time soup. Cover and simmer on low heat. 4. Garnish with 2 to 3 slices of watermelon radish, ripe avocado chunks, a few sprigs of chopped dill, a sprinkling of Maldon salt, and freshly cracked black pepper. Above is a video for you to watch exactly how to make it! Note that while blending, because the soup mixture will be hot, you want to keep the small feed hole open so steam can escape. Simply use a clean cloth to cover it up so it doesn’t splatter everywhere! This soup base is a great go-to 'cream of potato soup'. Boiling the cashews with the potatoes makes them blend easily and provides the heavy cream we are looking for. And the possibilities are endless: add roasted shallots and mushrooms as garnishes (which I've done previously in my Instagram gallery- go look). You could add vegan shredded cheese, shiitake bacon, and green onions on top to make it fully loaded potato soup. Or, you could simply serve it with a drizzle of truffle oil and cracked black pepper. Now that sounds good! You want to make sure the potatoes are cut into chunks so that they cook faster. This makes the cooking time very short... around 15 minutes max. If you have been a fan of MV for a long time, you might notice that this is actually an older recipe that I’ve given a face lift to. It’s true! It originally was a curried potato soup with crispy chickpeas! I still love that variation and I recommend that you try it as well. The results will be a bright yellow soup instead of pink. Simply swap out the beets with one tablespoon of curry powder. To garnish, how about these crispy spiced chickpeas? Preheat the oven to 400 degrees F and line a baking sheet with parchment paper. Mix together in a bowl the chickpeas, olive oil, spices, nutritional yeast, and sea salt. Mix well and toss onto a baking sheet. Spread evenly and bake for 30-40 minutes, removing and tossing halfway through to ensure even cooking. Once toasted to desired texture, remove and use to garnish soup or keep in an airtight container for a snack. You can also use just a mixture of your favorite seasonings for the chickpeas as well. If you don't have access to pre-made Indian spice blends, try mixing dry turmeric, cumin, cinnamon and a dash of nutmeg and clove together. Since the chickpeas are already cooked, you can taste them before roasting to see if you like the way they taste. Just have fun with it! In regards to the roasting time, I only roasted mine for 30 minutes and the texture was a bit soft- which I liked! The texture reminded me of roasted potatoes. Now, you can certainly roast them for an extra 10-15 minutes to make them crunchy. It just depends on your mood and what you want. Do be careful towards the end- you don't want them burning! This post is sponsored by Archer Daniels Midland ( ADM ) Company. All opinions are my own. This tempeh recipe is absolutely perfect! The glaze is sweet, tangy, and savory, with just a kick of spice. The texture of the tempeh is firm yet tender with a delightful crunch. The trick to making good tempeh is to steam it, which removes the bitter taste it can have straight out of the package. With this technique, the marinade is poured over the tempeh and wrapped tightly in foil. While baking, it’s not only steamed, but all of the flavor from the marinade is infused throughout. To finish, remove the foil and continue baking in the oven. This thickens the glaze and the tempeh becomes nice and firm. Soy protein is one of the few plant-based proteins that is comparable with animal protein, providing all the amino acid building blocks at levels and the availability needed by the body. This is why it works as a delightful protein source for many different meal variations一 serve it with steamed broccoli, asparagus, carrots, sugar snap peas, or green beans and a fluffy grain like quinoa or rice. You can also try it with buckwheat or rice noodles, it works beautifully. Tempeh is super easy to slice, you can try cutting different shapes and sizes for fun variations. By combining sweet apricot preserves with tangy whole grain mustard, savory tamari, onion, garlic, with a touch of vinegar, fresh bay leaves and crushed red pepper flakes, you are left with a marinade that is truly a party for your taste buds. 2. For triangles, cut the blocks of tempeh in half, lengthwise (like slicing a thin loaf of bread in half for a sub). Then cut into squares and finally, triangles. For batons (small long rectangles), cut the block of tempeh in half, lengthwise. The cut in half and into small batons (see picture above). Transfer to a 9” x 13” baking dish. Set aside. 3. In a medium-sized bowl, add the apricot preserves, nutritional yeast, onion powder, garlic powder and red pepper flakes. Mix until smooth. Then add the water, tamari, mustard, olive oil, vinegar, and minced garlic. Mix well and give it a taste. Season with salt and pepper to your liking. Did I mention that this tempeh works perfectly as a filling for spring rolls?. The combinations and variations are endless. To start, instead of baking the tempeh into triangle shapes, you simply cut the tempeh into strips, like batons. This makes it easier to fit the tempeh into spring rolls. For the filling, I recommend using any kind of lettuce you desire (spinach, shredded romaine, or arugula work great!). To make the spring rolls, hold a large piece of rice paper in the sink and run some water, just to wet it briefly. Transfer the sheet to a cutting board. Then, add 2 to 3 tempeh batons, some fresh herbs (like cilantro, Thai basil and mint). As for the dipping sauce, here is a delicious miso-tahini recipe that I absolutely adore! Did you know that miso is made from soybeans? Yep, it’s a traditional Japanese seasoning produced by fermenting soybeans with salt and koji and sometimes rice, barley, seaweed or other ingredients. You can use any leftovers as a salad dressing or as a dip with roasted veggies. Combine all ingredients into a bowl and whisk together until smooth. Serve immediately or keep in a tightly sealed jar in the fridge for up to one week. I hope you all enjoy this recipe! If you do make it, please leave a review on the blog and/or tag me on Instagram. I love seeing your creations. Most importantly, remember to have fun. Happy cooking! The new year is just a few days a way people! That means it is time for all you to plan on what you’ll be cooking. Now, if you own my cookbook you would know that I have a pretty killer Hoppin’ John Stew which is perfect for the occasion. However, because all of you don’t own my book (which makes me cry), I decided that I should have another perfect recipe for ringing in the new year. And this is it…My New Year’s Stew! If you didn’t know, you’re supposed to eat black eyed peas and greens for good luck in the new year. Think of it as an invitation for wealth and success to come into your life. Can’t hurt, right? Some say the greens represent money and the black eyed peas represents pennies (wait a minute, pennies? Can’t we shoot higher than that!?). Others say to eat cornbread as it represents gold. I honestly don’t even need a reason to eat any of these things because I love them all! You ain’t gotta tell me twice to eat no damn peas with rice, tender greens, and cornbread! Please. Aside from all of the luck and tradition, this dish was inspired from a recipe my mama would make for my father. It was basically braised cabbage with potatoes and sausage, a Polish classic. (If you didn’t know I am part Polish, now you do.) To veganize this dish, I used Beyond Sausage (not sponsored!) because the texture is incredible and the flavor is spot on. I like to add carrots for sweetness and tomatoes for some acidity. Green bell peppers and celery add freshness. Of course, by adding the black eyed peas and collards, this becomes a New Year’s classic. So make sure to invite some friends over and enjoy this stew with fluffy white rice and large chunks of cornbread. Happy New Year! 1. If you are using dried peas, you will need to soak and cook them. Hop on down to the close up shot of the peas at the bottom of this post to learn how to do so. If you are using canned peas, simply open ‘em up and give them a good rinse. Set aside. 2. In a large pot (at least 7.25 quarts*), add onions, bell peppers, celery, carrots and a good drizzle of olive oil. Season with a few pinches of sea salt and pepper. Bring to medium heat and cook for about 7 minutes, until the vegetables become tender and juicy, stirring every so often. 3. Next add in the garlic, potatoes, cabbage, nutritional yeast, onion powder, garlic powder, vinegar, tamari, sea salt, pepper and red pepper flakes. Give it a good mix and cook for an additional 7 to 10 minutes, stirring every so often, until the cabbage becomes soft and tender and it smells delicious. 4. Add the sausage, tomatoes, black eyed peas and water. Bring to a boil and reduce the heat to low. Cook at a low simmer with a cracked lid, stirring every so often, for about 20 to 30 minutes or until the potatoes are tender to fork. Once done, throw in the collard greens and cook for an additional 5 minutes, until they become tender. 5. To serve, ladle the stew into bowls and garnish with fluffy white rice, freshly chopped chives, and a sprinkling of sea salt and black pepper. Hot sauce is welcome! As I said, this recipe makes A LOT. I used a large 7.25 quart dutch oven and the full amount fit perfectly. If you do not have a pot this large, I would cut this recipe in half and you should have no problems. When making rice, I would think 2 cups of dried would make enough for this recipe. To garnish, I would scoop about 1/3 cup of cooked rice on top. The rice is more of a garnish so the ratio of rice to stew should be more stew, you feel me? When cooking rice, at a bare minimum, I always throw in some sea salt, olive oil, pepper, rice vinegar and a few bay leaves. You should do the same as this makes for flavorful rice. 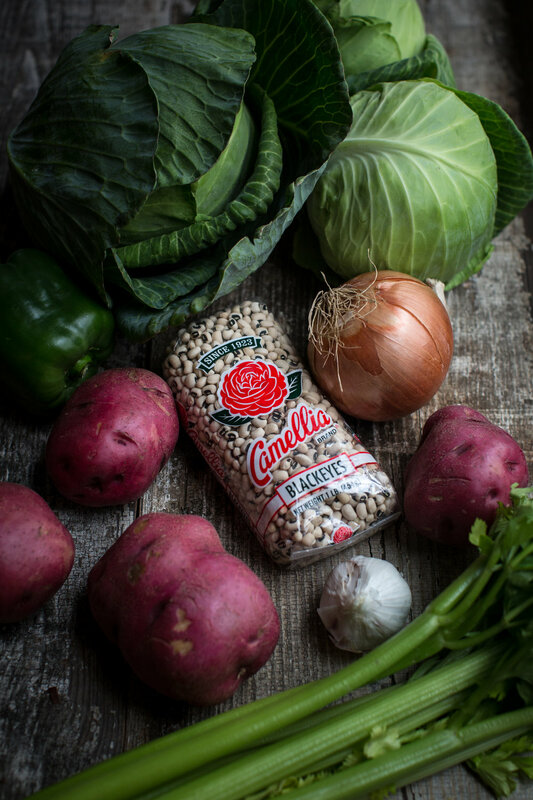 I grew up eating Camellia beans and black eyed peas, so they are very nostalgic to me. Funny enough, the packaging hasn’t changed since I was a little boy. Feel free to buy your peas from the bulk section if you’d like and if purchasing canned peas, I try to buy organic and non-BPA lined cans. I like this stew because it is so hearty. See those big chunks of cabbage? Don’t worry, they become tender and succulent. This is the perfect contrast to large chunks of boiled potatoes and dark green strips of collard greens. The black eyed peas provide little plump pops of texture and flavor. Cute, right? When serving soups and stews, I always like to sprinkle on top some sea salt and pepper for an extra kick of flavor to enhance the dish. If you ask me, cooking dried peas and beans can be quite therapeutic. Sorting, rinsing, soaking. I love it! Of course, they also taste better than canned and rightfully so. You showed them some extra TLC and any pea or bean will appreciate that. Some require more time to soak and take longer to cook, so these instructions may vary for other varieties. Right now, let’s just focus on black eyed peas, as they take less time to soak and cook than most and we’re using them in the recipe. I like to soak my peas over night. First, sort through them and remove any weird pieces or anything other than peas. Then cover the peas with a few inches of water. This allows the water to slowly absorb into the peas which allows them to cook evenly and more quickly. This also draws out some of the phytic acid, which can cause bloating. If you are strapped for time but would still like to do this, you can do a quick soak. Simply throw the beans in a medium sized pot and cover with an inch or two of water. Bring to a boil and remove from heat. Cover with the lid and let the peas steep for 30 minutes. Drain the peas and rinse them well. To cook, transfer the drained peas back to the pot and cover with fresh water. Throw in a piece of kombu (dried seaweed- for flavor and to help aid in digestion), a bay leaf or two, and bring to a boil. No salt as this will make them tough! (Sometimes I’ll add splash of vinegar and a drizzle of olive oil, it really just depends on my mood.) Reduce the heat to low and simmer for about 30 minutes, stirring every so often until the peas are tender. Done! You can then drain the peas and add them to a recipe. Or you can store the peas in a jar with the cooking liquid for a few days. If using for a soup or a stew, feel free to use some of the cooking liquid as it has good flavor as well. There’s nothing quite like a crowd pleasing appetizer to offer at a gathering or bring to a party. A quick and easy idea is to create a delicious spread with a drizzle of olive oil and a dusting of spice. By placing the spread in the middle of a platter loaded with colorful vegetables, crunchy crostini and salty olives - it’s the perfect dish for a party. Everyone can grab exactly what they want, and there is no fuss! Not to mention, a spread like this can be made a few days in advance and can handle sitting out on the table for a few hours. For this variation, I am teaming up with Amy’s (whom I just love!) to bring you a black bean spread. Talk about an effective shortcut, I start this recipe off with their refried black beans, which are already loaded with flavor. Then I doctor them up with additions like caramelized garlic, fresh lime juice, cumin and smoked paprika. Yum! Feel free to push and pull this recipe to your liking: instead of using garlic, try minced shallots. Instead of using smoked paprika, try sweet paprika. A pinch of curry powder? Sure! Freshly chopped oregano or cilantro would be a lovely addition as well. Once the dip is surrounded by an array of delicious dipping options, you’ve got yourself a lovely holiday appetizer. 1. Add the beans to a medium-sized mixing bowl. Squeeze on the lime juice and add the onion powder and garlic powder. Mix well and set aside. 2. Add the olive oil and garlic to a skillet and bring to medium heat, stirring every so often with a spatula. Cook for a good 5 to 6 minutes until the garlic becomes soft and golden. Lower the heat just a tad and add the oregano, cumin, cayenne pepper, nutritional yeast and smoked paprika. Continue to stir and cook for another 4 to 5 minutes. The mixture will look thick and bubbly. Once your kitchen smells outrageous and the garlic is fully caramelized, transfer to the bowl of beans and scrape every last drop out. 3. Mix everything together vigorously. Give it a taste and season with salt and freshly cracked black pepper to your liking. Transfer to a pretty bowl and garnish with a dusting of smoked paprika and a drizzle of olive oil. You can use any assortment of vegetables, such as carrots, sugar snap peas, green beans bell peppers. If you are going to add a crunchy green vegetable, like green beans, asparagus or broccoli florets, I suggest that you lightly steam them or pour boiling water on then rinse them with cold water. This gets rid of that chalky raw taste and makes them more enjoyable. A fun option as well are thinly sliced apples and crunchy crostini or any kind of cracker. I also love using olives and other pickled vegetables, from the olive bar, like artichoke hearts and baby peppers, for a variety of color and texture. Salted and roasted Marcona almonds also pair beautifully with this dip. If you’ve never made crostini, here’s a super simple recipe. 1. Preheat the oven to 400 degrees F. Slice the baguette into ½ thick slices. Drizzle some olive oil onto a small plate. Press one side of a bread slice into the oil until coated. 2. Place the slice oil side up on the baking sheet and repeat this until all the slices are coated. Sprinkle with sea salt and nutritional yeast and bake in the oven for 10-15 minutes until the edges are golden brown. The whole point of a vegetable platter like this is to have fun and make it gorgeous! Think lots of color and enticing textures. I definitely recommend hitting up your local farmers market for unique produce and fresh herbs to garnish. Sign up here for more tasty recipes like this from Amy’s. Ahh, risotto. Creamy, luxurious, and incredibly satisfying, this dish is a quintessential classic. There are many different variations out there and one of the more popular combinations is with mushrooms and peas. Sounds good to me! In my vegan rendition, since we are not adding any dairy cheese or cream, I like to create a strong depth of flavor with mustard and miso (a trick I learned while working as a server in a restaurant in NYC). The tang from the mustard and cheesiness from the miso works wonders for the creamy rice known as 'Arborio'. My other secret weapon is rosemary. This powerful herb offers a very strong savory flavor that is earthy and robust. It works beautifully with rice and mushrooms. In regards to risotto, I think people are intimidated, but I am here to prove to all of you that it's really not that bad! Matter of fact, it's quite simple. The most important ingredient is time. Instead of cooking the grains in one large amount of water all at the same time, you slowly add it, little by little. The rice slowly absorbs the liquid and the result is a luxuriously creamy dish. The key here is to only add a warm liquid so that it cooks perfectly. That’s why you heat up the vegetable broth before cooking. As for the veggies, I like to add asparagus and blanched fava beans for a nice crunch and variation in texture, but you could add whatever vegetables you like. Frozen peas work beautifully! When making this dish, I recommend serving it immediately as that’s when it’s best. A crusty piece of bread works as the perfect vehicle to help scrape the sides of bowl- just sayin’. 1. Add broth to a small pot and bring to a boil. Remove from heat, cover and set aside. 2. Melt butter over medium heat then add olive oil, mushrooms, onions, and a pinch of salt and pepper. Sauté for 5 minutes until onions are soft. Add garlic, rosemary, nutritional yeast and arborio rice. Stirring often, cook for an additional 3-4 minutes until garlic is soft and rice is toasted. Add the wine, mustard, and miso and mix well. Cook for a few more minutes until the wine has evaporated, stirring frequently so the bottom doesn’t burn. 3. Once the wine is evaporated, add 1 cup of warm broth to the rice mixture. Continue to cook over medium heat, stirring often, until the broth is absorbed. Repeat this step, adding the broth in 1 cup increments, until risotto becomes thick and creamy. This should take about 20-30 minutes. If the risotto seems done, give it a taste and you will now. The rice should be chewy, firm, yet tender. You may not use all of the broth and that’s ok. Don’t have a melt down. 4. At this point, you can fold in whatever vegetables you are using along with the shredded vegan parm. Give it a taste and season with salt and pepper to your liking. Continue to cook, stirring constantly, until the asparagus is tender and the peas are bright green. Remove from heat and serve immediately. This holiday pizza is the perfect crowd pleaser. I love that it uses leftover scraps of holiday ingredients like hazelnuts, brussels sprouts, and cranberry sauce. The best part is the recipe starts with a delicious Amy’s frozen pizza as the base, which makes it super fast and super easy. (I always have 1 or 2 as a backup in the freezer!) It’s the perfect solution for serving to family or guests when people are hungry and you need something quick. Feel me? The brussels sprouts are tenderized and infused with flavor before placing on top of the pizza from a splash of vinegar, sprinkling of nutritional yeast, orange zest and orange juice. This really elevates their flavor which pairs beautifully with toasted hazelnuts and cranberry sauce. I like to add dollops of any store-bought vegan nut cheese, but you could totally skip that. This recipe is all about using what you have and being super easy. After the pizza is baked in the oven, I love adding fresh oregano for a pop of color and fresh flavor. Do note that I’ve made this pizza multiple times now and I can honestly say that I love it and I think you will to. 1. Preheat oven to 425 degrees F and line a baking sheet with parchment paper. 2. Spread the hazelnuts on the baking sheet and bake them for 10 minutes, until fragrant and lightly toasted. Remove them from the oven and set aside to cool. * Once cooled, using the side of your knife, gently press down on them until they break in half or into smaller pieces. Set aside. 3. Add the brussels sprouts to a skillet, along with the water, vinegar, nutritional yeast, orange zest, orange juice, olive oil, salt, and pepper. Bring to medium heat, stirring every so often. Cook until liquid has evaporated and the brussels sprouts are tender to fork. Remove from heat and let cool. 4. Using the same parchment-lined baking sheet as the hazelnuts, remove the Amy’s frozen from the box and place in the middle of the pan. Artfully add the brussels sprouts. Then add ½ teaspoon dollops of the cranberry sauce scattered across the top (to make sure each slice gets some). If using cheese, repeat this step, scattering small dollops across the top. Bake in the oven for 14 minutes. 5. Once baked, remove from oven and sprinkle on the hazelnuts. Garnish with fresh oregano leaves, slice, and serve. If you cannot find hazelnuts already peeled, you can do so at home. After they are roasted carefully transfer them to a paper towel and wrap up the edges. Rub them around until the peels flake off. It’s ok if they are not completely peeled. Don’t beat yourself up about it. You can use whatever store-bought vegan nut cheese you desire: almond ricotta, cashew herb, etc. This pizza is delicious cold! I tried some the next day and I was surprised at how much I enjoyed it. This recipe is quintessential fall. 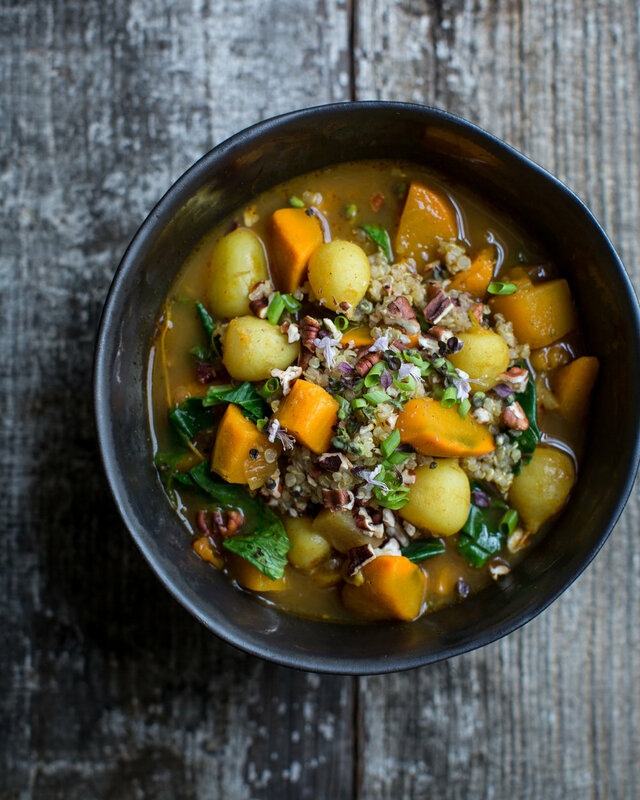 It’s loaded with curried root vegetables like beets, radishes, turnips, winter squash, and sweet potatoes. The broth is infused with loads of earthy and spicy curry powder which is the perfect warming up spice for the cool weather that’s coming in, albeit slowly here in New Orleans! Nonetheless, fall is fall and I was ready for some stew. So that’s precisely why this recipe came to fruition. I’m keeping things super simple by throwing most of the ingredients in at once in the beginning. No need to fuss. Once things are nice and tender, I introduce some garlic, ginger, vinegar, sweet mirin (a cooking wine), nutritional yeast, and tamari. All of these combined results in a super flavorful, savory, and delicious broth that becomes infused in the tender and succulent root vegetables. To be resourceful and fun, I like to throw in some of the green tops from the beets and turnips. They provide a nice body to the stew and they’re delicious! The only thing that could make this recipe any better is a fluffy grain to go on top with some toasted nuts. I chose quinoa and pecans because that screams fall to me, but do what you will with what you want. I’m not here to tell you what to do (well, kinda). Make the stew, have fun, and share it with friends. 1. In a large pot, add olive oil, onion, sweet potatoes, beets, butternut squash, red kuri squash, and turnips. Bring to medium heat, stirring often, and cook for about 10 minutes until the onions are soft and the vegetables begin to brown. 2. Next, throw in the garlic, ginger, curry powder, nutritional yeast, and cinnamon. Cook for an additional 5 minutes, stirring often, to toast the seasonings and spices and soften the garlic. 3. Add the mirin, water, tamari, chopped tomatoes, sea salt, and bay leaves. Turn the heat up to medium high and bring to a boil. Once at a boil, reduce heat to low and simmer for about 20 minutes, until the vegetables are tender and succulent. Once they are done, throw in the shredded beet greens and turnip greens. Give it a taste and season with salt and pepper to your liking. Cook for a few more minutes until the greens are tender. 4. 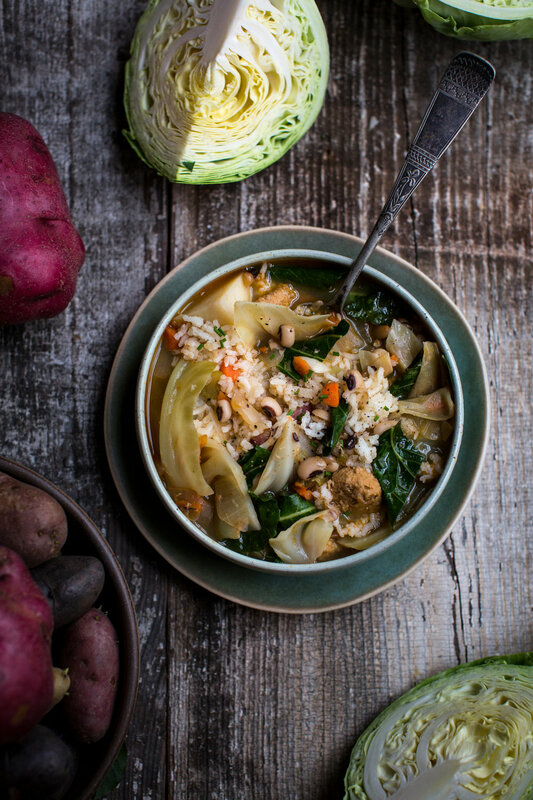 To serve, remove the bay leaves and ladle the soup into pretty bowls. Add a scoop of fluffy quinoa in the middle and sprinkle on top some toasted pecans and whatever fresh herbs you desire. On the side, serve a small slice of lemon with each bowl to be squeezed on top right before consuming. Mirin is a Japanese cooking wine that is sweet and pairs perfectly with tamari or soy sauce. It works beautifully in marinades, soups, and salad dressings. I recommend this brand. For the quinoa, I like to add a splash of rice vinegar, a sprinkling of nutritional yeast, a few pinches of salt, a crack of pepper, and a drizzle of smoked olive oil or toasted sesame seed oil before cooking. You could also add a pinch of curry powder and cinnamon to echo the flavors in the soup. You can totally eat the tops of beets and turnips. Just make sure to rinse them thoroughly as they can oftentimes be sandy. I don’t particularly like them raw, but once they are wilted in a hot broth, they become tender and delicious! Ooooh, these green beans are a kick in the mouth! That's because they are loaded with stimulating seasonings like coriander, chili powder, crushed red pepper flakes, and curry powder. They are also coated with crunchy, buttery sesame seeds and spicy mustard seeds that provide a lovely pop. Savory and fantastically spicy, these beans are an explosion of flavor in the mouth. So I had to name them after firecrackers, right? Feel free to play with the spice combination. If you don't have one or two, simply take them out and add a little more of the other stuff. And if you don't like spicy, maybe hold back on the red pepper flakes and chili powder. They will still be good. The trick to this recipe is to toss the green beans thoroughly so that they are coated with all of the seasonings. The other trick is to make sure the oven is preheated and piping hot. Green beans love to shrivel up when it's hot like that, becoming succulent and tender, while still having a slight crunch. 2. Rinse and dry the green beans thoroughly (if they are too wet, they won't hold the seasonings that well and you will look silly). Transfer the beans to a large cast iron skillet, baking dish, or baking sheet (use parchment paper if so). 3. Throw on the coconut oil, tamari, red pepper flakes, black pepper, curry powder, turmeric, coriander, cumin, chili powder, sesame seeds, mustard seeds, and nutritional yeast. 4. Place the skillet/dish in the oven and cook for 30 minutes, tossing once halfway through. Gobble up immediately! 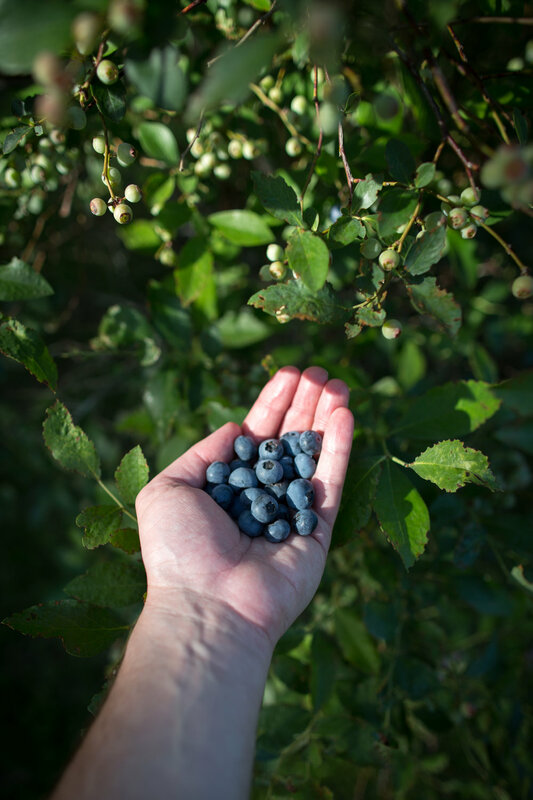 There's nothing quite like picking fresh blueberries right off the bush, wouldn't you say? And there's no better way to enjoy the fruits of your labor than with a cobbler. I'm sure we can all agree with that one! Now when it comes to the world of cobblers, I've noticed that they are predominately created in 3 different ways. One way is with a crust, similar to a pie, that's flakey and dense, with a top and a bottom (yum!). Another way is with a more a biscuit-like topping (also fabulous). The final other way is more of a 'cakey' fluffy batter. For this recipe I decided to go the 'cakey' route, because 1) I have so many pie and biscuit recipes in my cookbook and 2) I was in the mood. Knowing me, it's still a recipe that's all my own with results that are unique compared to traditional recipes, although some might say this was pretty darn close to a 'Texas Style' blueberry cobbler. You see, if I had to give you the best description, this creation is best described like so: If a blueberry cobbler and a blueberry muffin had a baby, this would be it. On the bottom you have piping hot blueberries that have burst and melded with tangy lemon zest and lemon juice, creating their very own jelly-like sauce. On top, you have a fluffy, moist, and decadent topping (you can thank the coconut milk for that) with a thin crispy top. The recipe also happens to be incredibly easy with only 10 ingredients. C'mon people. Find your closest u-pick, grab your basket, and get into it. 2. Rinse the berries and drain them well. Transfer 3 cups to a 9" x 13" baking dish, or desired dish similar in size. Add the lemon zest and lemon juice. Toss to mix and spread into an even layer. Set aside. 3. For the batter, cream together the butter and sugar, mixing with a fork. Add the coconut milk and vanilla extract and mix well. Add the flour, baking powder, and sea salt. Mix until just combined and pour over the blueberries hanging out in the baking dish. Sprinkle with additional blueberries and desired amount of sugar on top. 4. Bake for 1 hour, depending on your oven until the top is golden and crispy. Serve immediately as is or with vanilla ice cream or coconut whipped cream. If you're into making your food look extra pretty like me, feel free to throw a few extra blueberries on top when there are 20 minutes left to cook. Ok, this has got to be one of my favorite cheap and easy meals. There is just something about this combination that's incredibly satisfying: fluffy, moist chunks of russet potatoes, tossed with a flavorful coating and baked until crispy, wrapped in a warm tortilla blanket with loads of refreshing goodness. Now, usually I like to give you guys some wiggle room with substitutions, but not for these three ingredients: russet potatoes, iceberg lettuce, soft tortillas. The combination of the starchy, fluffy russet potatoes, crispy iceberg lettuce, and the soft texture of a flour tortilla truly *makes* this recipe. As for the aioli, you can simply use any vegan mayo, or a flavored one at that. But the aioli below is not only creamy and rich, but tangy and bursting with flavor from the cilantro and lime juice, a perfect cool contrast to the spiced potatoes. I assure you, after trying this one time, it should become a new stand-by recipe for an easy weeknight dinner or a festive dinner party- buffet style. Promise. 1. Preheat oven to 400 degrees F and line one large baking sheet with parchment paper. 2. Cut the potatoes into bite sized chunks. In a large mixing bowl, combine the potatoes, black pepper, onion powder, garlic powder, chili powder, cumin, nutritional yeast, and flour. Toss and mix well. Pour in the tamari, vinegar, oil and continue to mix and toss until all the pieces are coated thoroughly. 3. Spread the poatoes in an even layer on the baking sheet and cook for 25 minutes. Remove and give one piece a taste. Season with sea salt as needed. Flip with a thin spatula and shake the potatos into an even layer. Bake for an additional 10 to 15 minutes, to get them crispy. 4. While the potatoes are baking, whip up the aioli. First, blend the lime juice, cilantro, jalapeño (if using), sea salt, and nutritional yeast in a small blender. Blend for a minute or two until you are left with a bright green liquid. Transfer to a small mixing bowl and add the mayo. Using a whisk, mix until smooth. Transfer to a squeeze bottle or tightly cover and keep in the fridge. 5. Assemble the tacos by placing on some lettuce, potatoes, sliced red onion, sliced jalapeño, fresh cilantro on a warm, soft tortilla. Drizzle with the aioli and enjoy. If you look in the refrigerated section of your grocery store, you might be pleasantly surprised to find 'raw' or uncooked soft tortillas! These are the best as you can simply cook them in a pan as needed. They are fresh, so delicious, and also do not have a long list of sketchy ingredients (like most soft tortillas do). Obviously, use whatever you can find but these are ideal. If you like spicy, go for the jalapeño option in the aioli. The heat from every pepper is different, so maybe give it a taste before deciding on how much to add. I used 3 tablespoons, but that's just me. I don't want any complaints if the aioli is too spicy just because you buggin'. These cookies remind me of that delectable part of the brownie that I love so very much. You know… when the edges become crispy and chewy? Like that. I've provided just a touch of peppermint extract to boost that seasonal flavor, while crushed peppermint candy canes add another pop of flavor, plus a beautiful crunch on top. I prefer a more chewy cookie, so I go for the longer baking time, but there is no right or wrong. Heck, the raw batter is scrumptious as is. The point being, you can push and pull this recipe in many ways, so have fun! Most importantly, these are a fantastic holiday cookie that anyone would be happy to sink their teeth into. Even the Grinch. 1. Preheat the oven to 350 degrees F and line two large baking sheets with parchment paper. 2. Combine the vegan butter, granulated sugar, light brown sugar, and sea salt in a mixing bowl. Using a fork or a hand mixer, blend until light and fluffy (if using a fork, this could take a minute). Add the vanilla extract, almond extract, peppermint extract, ground flax meal, and milk. Mix well and set aside. 3. In a separate bowl, sift together flour, cocoa, coffee powder, and baking soda. Mix well. Add the dry to the wet and mix well until the batter is incorporated. 4. Scoop mounds (about 2 tablespoons in size) onto the baking sheets with a good amount of space in between each cookie (about 1 ½ inches at least). Next, spray the tops of the mounds with cooking spray and using your finger or the back of a spoon, gently press the cookie dough mounds flat, helping to shape them into beautiful cookies. You don't have to press them too much, so please take a chill pill. Sprinkle the tops with desired amounts of mini chocolate chips and pop them in the oven. Bake for 10 to 15 minutes, depending on how soft/chewy you like your cookies. 5. Once done, remove from oven. IMMEDIATELY, sprinkle the crushed peppermint sticks on top and gently press in any large pieces of candy cane there may be. This will make sure everything sticks. Let cool for a few minutes, then transfer the cookies to a wire rack to let set, about 10 minutes. If using smaller baking sheets, you might have to make more than two batches, as the cookies will spread and you'll need more surface area. Just keep the dough covered in the fridge if this is the case. I found these to be delicious hot out of the oven, once completely cooled, and the next day. Each stage offers different characteristics of enjoyment, so try them all ways! Do note that after about 2 days, they will go soft and taste a bit stale. In regards to the candy canes, I used a hippy-dippy organic brand from the health food store. This means the sugar is not refined (vegan) and the dyes are made from plants (not chemicals). You can, of course, use whatever kind of candy canes you like- I'm just letting you know what I used.